Following on from my rather sombre post yesterday, I thought I’d cheer everyone up again – by feeding you! I’ve made this dish for just about everybody who has ever visited us in Spain, and it’s been a winner every time. I’ve been meaning to post this recipe for some time, but for one reason or other I haven’t got round to it, but I’m not going to selfishly keep it to myself any longer. This is for you, Cathy – as promised! The beauty of this dish is that you can do the preparation in advance, so that when your guests arrive, you’ll have plenty of time to relax with them, (enjoying a glass of wine), before you knock their socks off with a delicious dinner! Put the diced chicken pieces and the chopped onion into a shallow dish. In a plastic measuring jug, juice the oranges and lemon, adding any bits of crushed fruit. Stir in the crushed garlic, olive oil, cinnamon, chilli powder and half of the chopped mint, to combine the ingredients together. You should end up with between 300-400 mls of liquid. Now, pour the juice mixture over the chicken and onions, add the chopped dates, nuts and whole black peppercorns. Cover the dish with cling-film, pop in the fridge and leave the chicken to marinate for anything from 10 minutes to a couple of hours. When you’re ready to start cooking, pick out the individual pieces of chicken with a pair on tongs, and gently fry them on a medium heat in the remaining tablespoon of olive oil. (Make sure you have picked out every last piece of chicken from the marinade). Turn the chicken pieces and when they are just starting to brown slightly, add all the citrus liquid mixture to the frying pan. Your dinner is now less than ten minutes from being ready! Turn up the heat under the pan, and bring the mixture to the boil. Allow to simmer and as it does so, the mixture will begin to thicken, making the most delicious tangy sauce. If you need to thicken the sauce a little more, just turn up the heat. Stir in the remainder of the fresh chopped mint and serve immediately. I usually serve Moroccan chicken with brown rice, but it’s just as delicious if you team it up with cous-cous. There will be enough for two people using this quantity of ingredients. I tend to use one medium chicken breast per person and adjust the amount of ingredients to personal taste. It’s always best to have a spare orange or lemon to add to the juice mix, just in case you need a bit more liquid. If you love dates, put a few more in – they go wonderfully sticky. If you don’t have dates you can use sultanas instead. When cooking for more than two people, I’ve been known to use the juice of a couple of limes, as well. The main thing is, have the confidence to alter this dish to suit yourself. 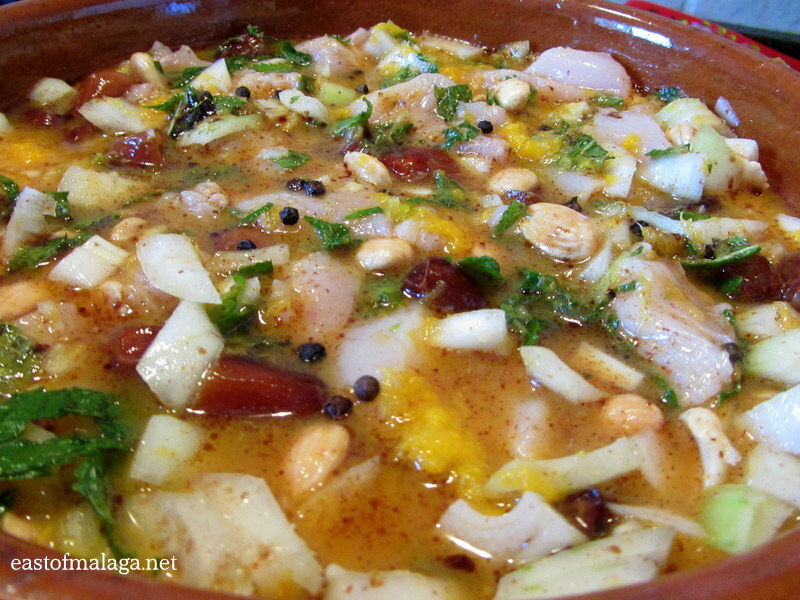 This entry was tagged Andalucía, chicken, East of Malaga, Food, Morocco, recipes, Tapas. Bookmark the permalink. Hi Issy – sorry for the delay in replying to your comment. I’m away in England at the moment, and haven’t had much access to the internet since last Tuesday. No, no need to add thickener – the mixture will thicken itself – and if you want to make it a little thicker just turn up the heat! Sounds as gorgeous as it looks Marianne.Don’t the nuts get too soft cooked along with the meat? Yes, they do soften, Madhu – but they only cook for the last ten minutes (or a little less) in the sauce. You could always throw the nuts in during the last two minutes if you want them a bit more crunchy! Don’t know why, but I really want to try this with duck fillets. Maybe its the orange. You know what – I think that would work …. beautifully! Oooh lots of ingredients there, Marianne. And the broth seems to have gathered all the mixtures of flavors with its color. Yes, it really draws in all the many flavours – to explode in your mouth! Beautiful – my kind of cooking (and eating)! Looks delicious Marianna! i will soon try to make this. Mmmmm … yes, it does smell delicious. I’m sure it must be similar for you at your place up the coast. I understand that, because you aren’t there all the time, it’s impractical at the moment. Fun planning, though! This looks wonderful! I, too, like to prep ahead and have time for wine. And I have fresh mint. I will try this. Let me know how you get on, wont you? I’d love to know. I get so much pleasure passing on recipes. Much like gardeners do when they share cuttings with each other! Well, you know it tastes good, don’t you? looks scrumptious Marianne! S is talking about travelling to Spain and Portugal next year … who knows? Looks amazing! Gosh, your food posts always make me so hungry. It’s very tasty, Jess, that’s for sure! Mm I might if I were a better cook! Unfortunately, I am probably the worst cook known to humanity. Once I set my pasta on fire…while it was in a pan of water. I’m still not sure how I managed that! I knowww haha. I am working on it though! The sad thing is my mum and sister are both brilliant cooks, so I must have missed out on some great gene there. Thanks, Marianne. Still can’t get my head around Anita. Aldi variety will do just as well. Yummy dish, and I want to make it too. Delicious food and a beautiful setting – perfect! This is a great dish to try, Meg. Looks so delicious! I always love the Moroccan chicken dish. I just copied 4 of your recipes and have saved them….first one will be the moroccan chicken and then the figs and goat cheese with bacon! Thanks! You’re welcome, Christine. I love sharing recipes. Looks great. My favourite Moroccan chicken dish has to be the pastilla! Enjoying your loquat jam at the moment! Thanks again. Oh Lord is this recipe delicious….the results are even more YummY!! Thank you so much Ms. Marianne. Works for me! Thank God I’ve just had breakfast! That looks superb Marianne ….. and almost easy enough for me to try as you’ve explained it so well!